Scuba pressure gauge, diameter 63 mm, nickel-plated brass 0-300 bar with high pressure hose 80 cm. Scuba pressure gauge, diameter 50 mm, nickel-plated brass 0-300 bar mechanical clockwork. Scuba pressure gauge, diameter 63 mm, nickel-plated brass 0-300 bar mechanical clockwork. 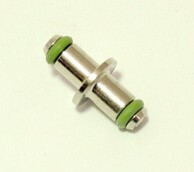 Scuba pressure gauge, nickel-plated brass 0-450 bar mechanical clockwork. Diameter 60 mm, 0-400 bar with glycerine. 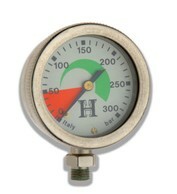 S.S. pressure gauge, diameter 50mm, 0-16 bar. Sviwel for air or oxigen. With quick discharge, pressure gauge 0-400 bar with glycerine.